Left foreground: Go-moku gohan (rice boiled with different types of food). Right rear: Mame gohan (rice with green peas). One Japanese recipe for a rice dish tells us to boil the rice in a seasoned stock with different ingredients. The dish is called takikomi gohan (takikomi means "boiled with," and gohan means "rice"). The ingredients  vegetables and perhaps some meat  give a slightly mellow taste to the rice because it absorbs their flavor, and they make the bowl of rice more colorful, too. This flavored rice is a joy to serve in the home because kids like it a lot and there's no need to prepare many side dishes to go with it. 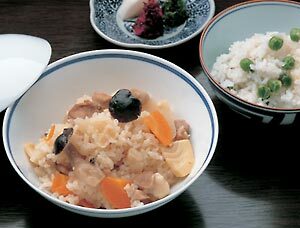 Rice has been a staple food in Japan for a long time. It was expensive in the old days, so to make it go further, cooks would often boil it with vegetables like daikon radish and potatoes, beans, and other grains like millet and fox-tail millet. 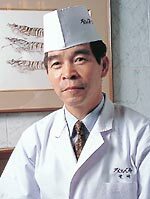 Mixing rice with other ingredients and boiling them together led to the development of different types of takikomi gohan. It's best to use ingredients that are in season. You could try bamboo shoots in spring, green peas or fresh soybeans in summer, chestnuts or matsutake mushrooms in the fall, or oysters in winter. Many cooks prefer to use local specialties as ingredients, to make a meal unique to their own area. A famous recipe in western Japan calls for the rice to be boiled with a whole fish, to make tai-meshi (rice with whole sea bream) or ayu-meshi (rice with whole sweet-fish). The recipe for go-moku gohan uses ingredients that are available anywhere, anytime. Go-moku literally means "five types," but here it means "different ingredients mixed together." You don't have to worry about how many or what kind of ingredients to use  you can use any foods that go well together. For these pages, our chef used chicken, carrots, bamboo shoots and shimeji mushrooms. This combination is a hit among Japanese people. Cooks in the West generally do not wash rice before cooking it, but in Japan it is always washed until the water is completely clear. The water is drained off through a sieve, then the rice is soaked for a while in the water it will be boiled in, to let it absorb moisture. This may seem like a chore, but it makes the rice tastier and more tender, and gives it a nice sheen. Place the pot on a high heat and bring to a boil. As soon as the escaping steam indicates the water is boiling, lower the heat to prevent the pot from boiling over, then simmer. This is the secret to making tasty boiled rice. When it's done, turn off the heat and leave the lid on, to let the rice absorb the vapor in the pot. When the rice grains are nice and plump, take the lid off to release the remaining vapor. Otherwise, the rice will become too sticky. These dishes were prepared by Dozaki Nobuyoshi, the head chef at a restaurant called Ginza Rokusan-tei. He has more than 40 years of experience as a chef, and tries to choose the freshest ingredients from regions that specialize in producing them. Not bound by the constraints of traditional Japanese cuisine, his recipes show his creativity and bring out the true flavor of the ingredients.